Articles that cover OS/2, eComStation or other topics that are specific to the OS/2 environment. 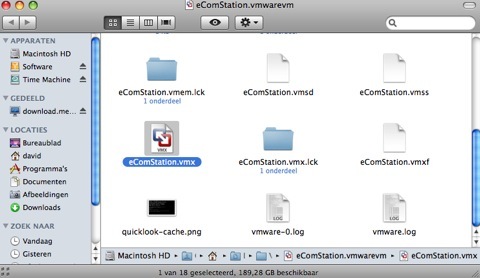 A how to on installing eComStation in VMware Fusion on the Mac. In my first job at Mensys we worked on OS/2. Since I was a long time OS/2 enthousiast it was a great opportunity for me to continue to play with the OS I loved. However even back then in 1999 OS/2 was a dying system and IBM was fasing out support. I played with Linux both at work and at home to find an alternative to OS/2. When VMware announced that they would add experimental support for OS/2 in a public beta of VMware Workstation 2.0 somewhere in 2000 I was one of the very first to try it. Unfortunately for us VMware decided not to support OS/2 in VMware and for a while I didn’t look at it. A couple of years later I learned from some people the tricks to get OS/2 to install in VMware. Since then I have regularly played with this option and for a while I even ran a Linux desktop at work. When I left Mensys I said goodbye to OS/2 and the PC and switched to the Mac. On the Mac there is a very good option to install OS/2 or eComStation in a virtual machine: Parallels Workstation for the Mac. However since at my current at Netco we use VMware at the datacenter I prefer to use VMware on the desktop as well. But every time I tried to install eComStation in VMware Fusion it failed. However some people put more time into it and found out how to do it. My ex-colleague Roderick Klein put me on the right track to finally make it happen. Since OS/2 or eComStation is not supported out of the box in VMware Fusion there are a few steps to take in preparation. When you start up VMware Fusion you should create a custom virtual machine. It doesn’t really matter which OS you select, since we will change this later on anyway. If you select other, make sure you customize your VM later on. We can get USB, Sound and Networking working, so make sure those options are selected. Once you have finished customizing your VM, you should quit VMware to make some customizations. To make the customizations you should locate your Virtual Machine on your system. Usually it is located in the ‚Virtual Machines’ folder in your ‚Documents’ folder. Once you have found it you should Control-Click on the virtual machine image and select ‚Show package contents’. In the folder you will find a configuration file which we will edit. The file can be recognised by the file icon with VMware Fusion logo and the file extension .vmx. To edit it you need an editor that will respect the UNIX line endings, TextWrangler is a good choice. After making these two changes you should not edit the configuration in VMware Fusion anymore, since this could undo these manual changes. With this change in place we are now ready to start the installation. If you boot eComStation from CD-ROM I found it would trap on the DANIS506.ADD driver. To circumvent this issue we go into the preboot menu and change the IDE driver to the IBM1S506 driver on the second page. The installation will detect most of the hardware options, so until we reach the networking page there are no difficulties. In the network pages you will find that the system did not recognise the network card, so you’ll have to select it manually. The one to pick is the ‚AMD PCnet Ethernet Family Adapter’. 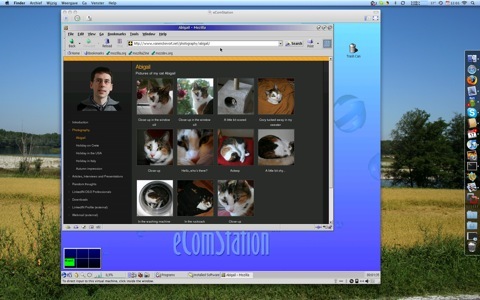 After that the installation is just a normal eComStation installation. Since OS/2 is not (yet?) officially supported by VMware there are some remaining issues. The most pressing issue is the fact that there is no VMware tools package, so don’t expect seamless intergration with your OS X desktop, you will have to click inside the window to give it the mouse pointer, and there is no unity view. Also no clipboard integration and printer setup is something you’ll have to do manually. However is a fairly functional platform. Networking and sound work, and the display rending is decent enough for most tasks.